Posted 6 years before by admin. - 838 views Views. Thanks for visiting the FarmVille ! Keep checking back here for updates, feature and quest guides, and general announcements about FarmVille. To thank you for visiting (and to entice you back) here is a free Unwither! Limit is 1 per Farmer. But hurry, this link expires at 8 PM PST on December 12, 2012! 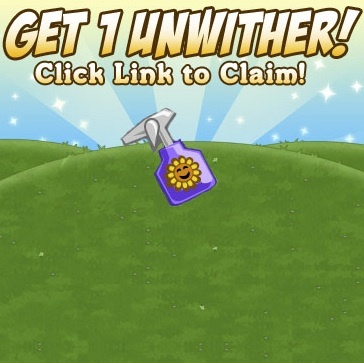 All you have to do is click the link to claim the free Unwither.